Having a beard is one thing and maintaining one is all together a different ball game! If you have a beard and want to sport it fashionably well then it's time to get a beard comb. Of course, there is a wide variety of combs available out there and you might feel lost but wait, don't give up hope yet! Picking up a comb for your beard is not rocket science but then not all combs are created equal or are fit for every type of beard. Hence, we have selected a list of 10 best beard combs that provide nothing less than optimum usage. So, shall we start the journey? The greatest benefit though of using a wooden beard comb is that wooden bristles help in minimizing breakage as well as damage to your beard. Last but not the least, you can stop worrying about static electricity because this is wood and not plastic! 5. ﻿Man Comb (Limited Edition) - The Ultimate Tool for your Hair, Beard and Beer﻿. 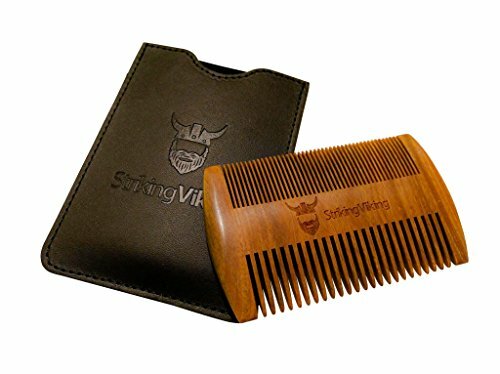 The Striking Viking wooden beard comb is quite compact in size and hence can be comfortably called a best pocket beard comb. You can carry it along and use it just about anywhere and that helps to maintain your beard whenever the need arises. It is a rugged wooden comb that has been constructed using 100% solid natural Sandalwood giving it a long life and high durability. It measures 4″ x 2.5″ x .25″ (6cm x 4cm x 1cm). coarse bristles that makes it compatible with all types of beard hair. This beard comb comes in a soft synthetic leather case that ensures superior protection. The wooden bristles prevent hair from completely drying out and this is achieved through proper distribution of oil from the skin/scalp to your hair. 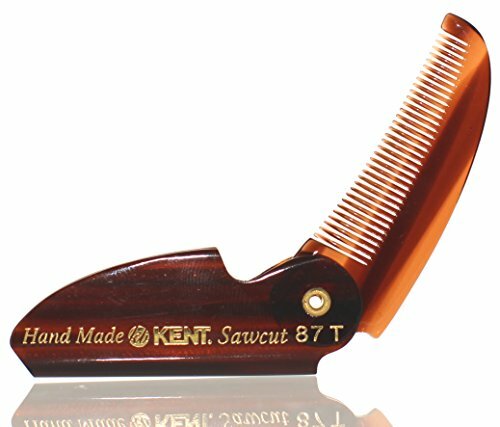 Why is the Kent 87T folding beard & moustache comb on this list of best beard comb for managing hair? Simply because, this handmade comb is compact enough to fit right into your pocket. This ensures you can comb your moustache and beard "on the go" or just about anywhere and anytime. Sounds interesting, doesn't it? This folding comb has been manufactured by G B Kent & Sons Ltd, a British firm with a strong history of brush making. This is not all, the company proudly holds an unbroken record of excellence when it comes to performance and quality. The 87T have been saw cut, and have then been hand polished as well as buffed in order to create the soft rounded teeth, which will provide protection to your hair from damage normally caused during brushing. The bristles have been made using cellulose acetate, which essentially is a type of non-petroleum based plastic. This simply means that you will experience less static as compared to other plastic combs. The Kent 87T folding comb has fine teeth that are just perfect for those little touch ups prior to events or a board meeting. This Kent comb can be used on beard as well as head and is great for thicker, wet hair. Sometimes the comb can be stubbornly difficult to open especially when you are in a hurry. The Sandalwood beard comb by Rocky Mountain Barber Company is definitely worth the mention on this list as it has been crafted using natural materials. This is one of the best comb for beard has been specifically designed for your beard and can be used for head hair as well. This comb has often been considered by the critics as one of the most versatile sandalwood comb for beards. You are probably wondering what makes it so versatile. Here's the deal! The design includes contour shaped teeth of varying widths to ensure maximum contact. 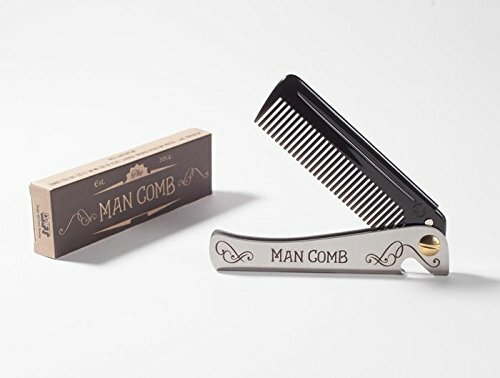 The design of this comb is such that the hairs of your beard will receive balanced contact especially when you are navigating it through the mane. It measures only 3.8" x 2.4" x 0.2" inches, which means it will fit nicely into your pocket. There is improved weight distribution, which essentially prevent various sections of your beard from getting under or over combed. Now that's a "must have" beard comb! 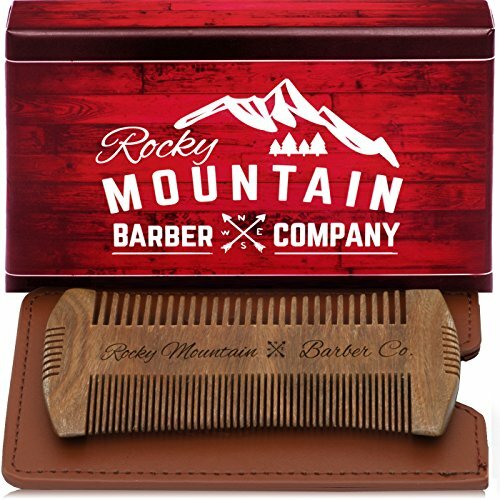 The Sandalwood beard comb by Rocky Mountain Barber Company comes with a triple threat beard grooming meaning; it has 3 different teeth width including fine, coarse, and precision edge. The comb comes in an attractive hand woven leather protective carrying case. This is a sandalwood comb and hence exudes the distinctive warm and woody scent that Sandalwood is famous for. The comb may snag coarse beard when used to often. It is not an unknown fact that most bearded men prefer a comb that is highly compact and versatile. 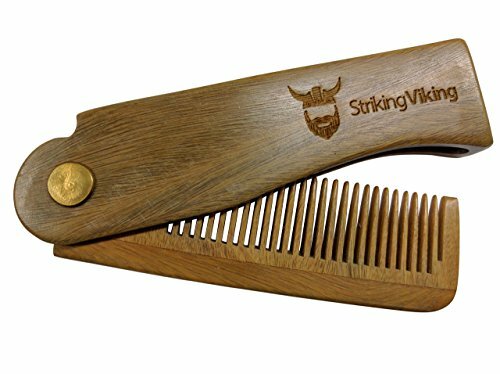 The folding wooden comb by Striking Viking is one such comb. It is compact and this makes it highly portable. You can just slip it into your pocket and use it wherever and whenever required. It measures 4.3 x 1 x 0.5 inches. The folding wooden comb has coarse teeth, which helps in maintenance of almost all types of hair. Since this is a wooden comb, it is highly durable and sturdy and will definitely last you longer than the plastic combs. In the latter case, the bristles tend to get damaged or break but that is not the case with this comb. Since the comb is made from wood, you will not face any issues related to static electricity. It has been constructed using Sandalwood and hence has a soothing fragrance that will have a calming effect every time you use it. It has a hygiene-augmented ergonomic design and can be used for both beard and hair. Since the comb has coarse bristles, it may pull on beard hair sometimes. 5. Man Comb (Limited Edition) - The Ultimate Tool for your Hair, Beard and Beer. The DAFT Man Comb Limited Edition is a true collector’s item although that doesn't mean that it cannot be used on a regular basis. This is one tough and compact flip comb that you will really feel good about using. The "compact" factor ensures it can be carried around in your pocket and the ultra stylish flip ensures people see you as fashionably smart. The DAFT man comb is a creation of DAFT® Design And Fresh Thinking, which is basically a process of combining advanced design as well as manufacturing process to create innovative hair and beard products. The man comb is a product of a wide range of processes including 3D printing, laser cutting as well as state-of-the-art injection molding. The man comb constitutes a stainless steel handle, which ensures it doesn’t corrode, and this is combined with a brushed finish that keeps it looking fresh. The comb itself is highly tough and durable as it has been made using materials that are used for making airplane windshields. The comb has a magnetic catch that essentially holds this comb in an open or closed position without the need for tightness adjustment. The man comb is expensive as compared to other beard combs in the same category or similar features. This is an amazing and innovative beard product from BushKlawz and that is why it is being features in the 10 best beard comb list. As the name suggests, it is a 4-sided pocket hair and beard comb. The truth is most beard combs are either single sided or double sided, hence 4 sided is quite rare to say the least. You are probably wondering, why you would need 4 different combing teeth. Well! If you are into sporting sideburns and love to show off your moustache then this product has been made just for you! Yes, the 4 different types of combing teeth are meant to take care of your hair, beard, moustache, and sideburns! The comb consists of wide and fine teeth and measures 4" x 2.5", which means it is compact enough to be slipped into your front or back pocket.. This is a comb that is perfect for all types of hair including short, thin, medium, thick, long, curly, or even straight. 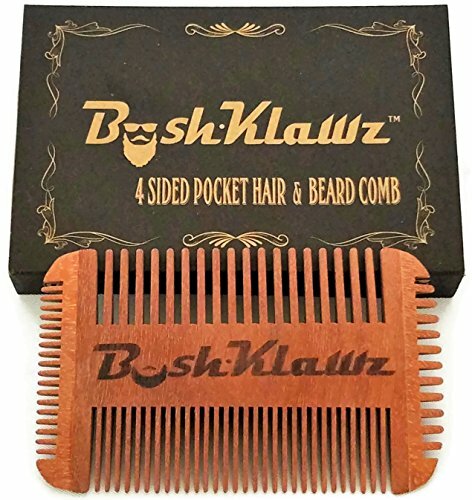 The BushKlawz 4 sided pocket hair and beard comb has gone through rigorous 3-stage sanding as well as polishing process so that you can enjoy snag free strokes every time. The comb has been made using high quality Pear Wood that has been handcrafted and no two pieces will look the same. The comb has been built by gluing 3 pieces especially the smaller combs. 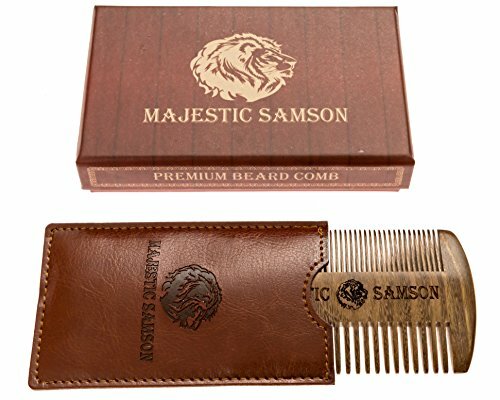 If you are someone with a love for something that oozes plenty of "vintage" feel then the Majestic Samson anti-static wooden beard and hair comb is just what you need. It has been made using red sandalwood, which gives off that rugged vintage feel and at the same time, it exudes a fresh fragrance that will soothe your senses. This majestic samson beard comb comprises of dual action teeth that ensure maximum grooming precision all types of beard or hair types. It is a hatchet beard comb that works great with coarse facial hair and helps in shaping, refining, and taming your hair in a way that they look stylishly distinctive. If you thought this hair comb works only for beard and hair then think again! This nice and compact product works great for sideburns and moustache as well. This is a versatile beard comb for men that works without any pulls and snags and is great for upper and lower lip grooming. This compact comb has an ergonomic design and prevents formation of any static electricity unlike its plastic counterparts. It works in a smooth action and helps in proper application of softener or oil to your beard as well as grooming products like sprays and gels to your hair. The teeth are not long enough to get deep down especially if you have very deep hair in your beard leaving those hair remain unmanaged. The Baxter of California men's beard comb is simple as combs can be! It looks almost like any pocket comb that you have ever come across but what makes it different is that it has been manufactured using high quality cellulose acetate sheets, which is basically a natural, modified polymer that has been derived from tree pulp cellulose and cotton. This compact comb has been handcrafted in Switzerland and undergoes a very much detailed 12-step process of manufacturing right from cutting all the way through polishing. Guess what? These intensive processes are all done by hand and this has resulted in providing the comb with smoothly tapered teeth as well as rounded tips that provide ultimate care and comfort for your beard and facial skin. It measures 3 x 4 x 2 inches but has been sized for precision combing and thus making your overall combing experience quite the deal! The Baxter of California men's beard comb has extremely fine teeth that do a great job when it comes to detangling beard hair. The comb works great with hair, beard, and moustache and works smoothly for application of oil. It is small enough to fit into your pocket and thus is portable. This comb works only for short beard and can produce static electricity. 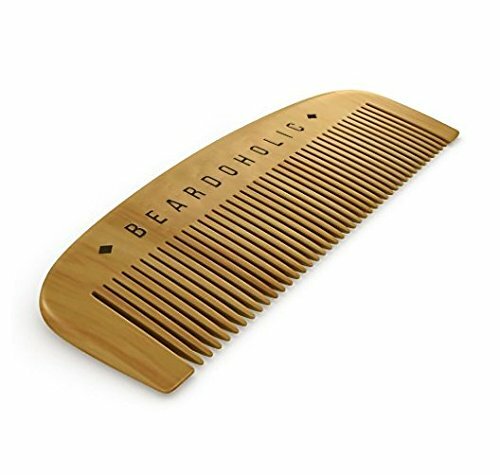 The Beardoholic fine toothed beard comb is one of the best beard comb available in the market today. What makes it different and stand apart from others are several features that are packed into this small or compact comb. It looks simple and yet oozes a certain elegance that can only come with wooden construction. Yes, this fine comb has been manufactured using 100% pearwood so that you can enjoy managing your beard for a long time. Strong wooden construction enhances its durability. It measures only 13.5*5 cm. The size makes it highly portable and can fit into your pocket with ease and is available in a nice little gift box. The wooden construction of the Beardoholic fine toothed beard comb provides great grip as well as easy control. The wooden construction also ensures it is anti-static and works as a great detangler by eliminating frizz and tangles. It is compact and hence ensures excellent styling as well as combing wherever and whenever you want. This comb does not work well for short beard. The Chicago Comb Model #2 matte for beard and moustache is one of the most minimalistic designs in combs that you will ever come across. It is a "Made in USA" product and the use of high quality stainless steel makes it highly durable. The comb has a special brushed metal, satin finish, which definitely leaves it mark thanks to the brilliant shine it exudes. What makes this stainless steel beard comb stands apart is the fact that it is a hand-finished product that has been created through dozen separate painstaking steps. The end result is increased smoothness of the tines, which provides one of the most comfortable user experiences ever. This #2 matte comb for beard & moustache and measures 4 inches (10 centimeters) in length. It is small and compact and will smoothly glide into your pocket. The lightweight feature in this product ensures that it does not feel greasy or weigh down your beards. The product comes at a relatively fair price given the high levels of service delivery. The Chicago Comb Model #2 matte for beard and moustache comes with a useful ring design at the end of the comb that will help in hanging up the comb post use. The comb has long fine teeth that work great for all types of beard. This comb can be used for short hair and moustache as well. This comb is too expensive for its size and functionality.